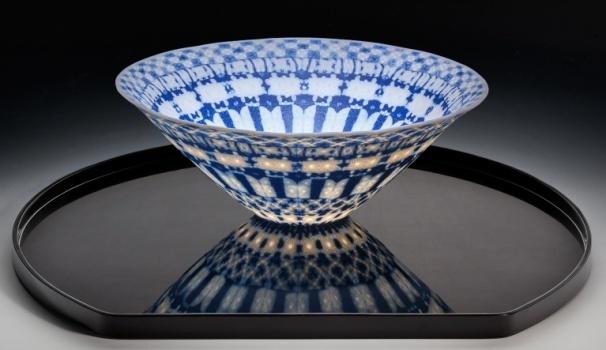 From the invitation card to her exhibition in Japan, early February, a nerikomi translucent porcelain bowl. Now you should know by now that Potty and I need to see your bottom - we're funny that way! Born in the States but gained much of her ceramic experience in the UK, Dorothy's work hasn't been seen here much in recent years due to her popularity elsewhere. P.S. Dorothy gave me permission to add the link. Such lovely,lovely work. Just a pity its so rare in this country.There are a couple in the V&A on show.Anyone know of anywhere else one can see examples in the flesh? Pennsylvania State Art Museum, U.S.A.
Arizona State University, Tempe, Arizona, U.S`A. Rochester Institute of Technology, New York, U.S.A.
Indianapolis Museum of Art, U.S.A.
John Michael Kohler Arts Center, Sheboygan, Wisconsin, U.S.A.
Kohler Company, Kohler, Wisconsin, U.S.A.
West,Texas University Art Museum, Lubbock, Texas, U.S.A.
Orton Cone Company, Ohio, U.S.A.
Metropolitan Museum of Art, New York, U.S.A. There have been a number of circumstances that have conspired to mean that Dorothy hasn't made any work in the UK for 5 or 6 years. It is possible that this might change in the not too distant future. Anyone have a photo of her mark? I don't believe she has marked her work since her very early days i.e. the mid 1970s.